Over the past four years I have been fortunate enough to teach hundreds of folks how to squat. It is fairly typical to find faults that crop up over and over again, e.g. improper depth, too vertical a back angle, or knees caving in, for instance. However, one issue that has been relatively new yet very persistent is The Elbow Issue. In truth, this descriptive cue is designed to get the lifter to raise their elbows just enough that the bar is secure, and the musculature about the shoulder girdle is maximally engaged. This produces a more effective platform for force transfer from the legs and hips through the back segment, to the shoulder girdle, and finally to the barbell resting on the shoulders under the spine of the scapulae. If the elbows are raised too far, however, these outcomes are compromised in such a way that can and often do negatively affect the squat. Grip width and related anthropometry. While a full treatment of the anthropometric factors relating to squat grip width and the subsequent positions of the upper limb is beyond the scope of this article, it is important to note that, in general, a wider grip produces more shoulder extension and more internal rotation of the shoulder. Additionally, a wider grip produces less contraction/shortening of the muscle bellies in the upper back, which tends to produce a less secure bar position and a less-effective force transfer mechanism compared to a narrower grip. A narrower grip produces a forearm position that is more parallel to the humerus, and which generates compressive force between the elbow and the wrist along the forearm. This pressure between elbow and wrist stabilizes the bar on the carry position without requiring excessive shoulder extension. In other words, the narrower grip traps the bar without the need for raised elbows. Wrist and hand position. Again, a full treatment of wrist and hand anatomy is beyond the scope of this article. Another article discussing that topic as it pertains to grip in the bench press and press is Gripping Matters. In the squat, the wrist position can again have a significant effect on the rest of the upper limb. If a thumbless grip is taken on the barbell, it is possible to achieve a neutral wrist position with almost any degree of shoulder extension, e.g. elbows can be up or down and the wrist can stay flat provided the hand moves along the bar. With the elbows jacked up too high, the palm of the hand moves up to a position on top of the bar to maintain a neutral wrist, but it’s possible. If the wrist is flexed there tends to be less contact between the hand and the bar, which commonly results in placing the wrist in contact with the bar instead of the palm of the hand. This position, which is also incorrect, permits the elbows to be raised much higher than if the wrist was held in a neutral position. On the other hand, with the wrists extended – which is typically seen with a “thumbs around” grip – the elbows tend to be a little lower, or are at a minimum blocked from being raised too high, because the wrist will not tolerate overextension under load with the thumbs wrapped around the barbell. In practice, a wrist wrap may be useful for lifters who must wrap their thumbs around the bar. Placing the wrist in extension under load may or may not be injurious, although I have seen and experienced enough discomfort personally and with my clients to think that loading the wrist repeatedly in this manner is not the best strategy long-term. If this is necessary, a wrist wrap may work as a support mechanism. Volitional Elbow Position. This isn’t quite anatomy-related, but is still a potential source of error. The book discusses the thoracic position, and perhaps the resulting elbow position has been misunderstood for a long time, but people have gotten the idea that they need to crank the elbows up as high as possible. This is akin to the idea that the squat must be performed with a vertical back angle: not the case when performing a low-bar position back squat correctly. We don’t want the elbows cranked up as high as possible, but rather up just enough to produce a very tight and secure back racking position. It is rare that I’ll have to cue someone with “Elbows up,” especially recently, so I’d probably round-file that cue unless I really need it. If the grip meets the above criteria, then it is good and the Barbell Gods will smile down upon you. It is worth fixing this issue early, as it’s particularly troublesome to correct later on, and can cause issues which we’ll detail below. 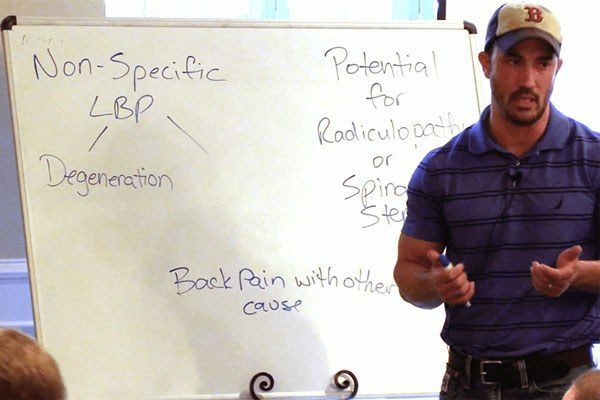 Movement of the barbell on the back is one of the most annoying and most common consequences of The Elbow Problem. When shoulder extension is excessive during the ascent of the squat the thoracic spine tends to go into flexion as a result. 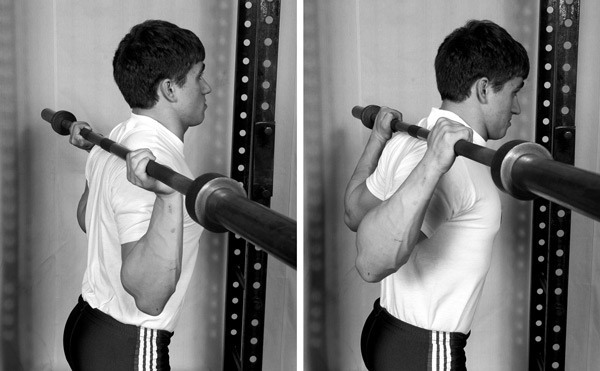 This allows the barbell to travel up the back. Some people incorrectly call this “pushing the bar up the back” – which, if you’ll think about it, is highly unlikely. Gravity acting on the weight on your back pulls the thing straight down, and it’s going to be pretty difficult to actually push the bar up your back using your hands in that position. Consider how much force you’d need to push a 500lb bar up your back with your hands. However, if a significant amount of thoracic flexion occurs, then the bar can roll up the back, since a small ramp has been created. Keeping the elbows down and spine locked into normal anatomical position prevents this from occurring. Another rather obvious result of this thoracic flexion is decreased efficiency in transferring force from the hips and legs through the spine to the bar. This is like an arm-bend in the power clean, in that it absorbs some of the force that would otherwise be transferred to the barbell. Again, this can be avoided by keeping the elbows in the correct position. Interestingly, the combination of the bar rolling up the back and thoracic flexion tend to produce the secondary effect of making the back angle more vertical. With the bar rolling up the back and thoracic flexion occurring, the lifter typically tries to lift the chest (and sometimes the head also) in order to stop it from happening. This isn’t a really good strategy when considering optimal squat mechanics, but it does tend to prevent the barbell from rolling up too far and thus allowing the bar to go forward of the mid-foot. This would not occur if the correct elbow and back position were maintained throughout the lift. Pain in the shoulder, elbow, and/or wrist can occur in those who have improper positioning of their grip and arms during the squat. This is obviously not the only cause of upper limb pain, but I have found that how the lifter carries the bar during the squat is more likely the cause than anything else barbell-related. 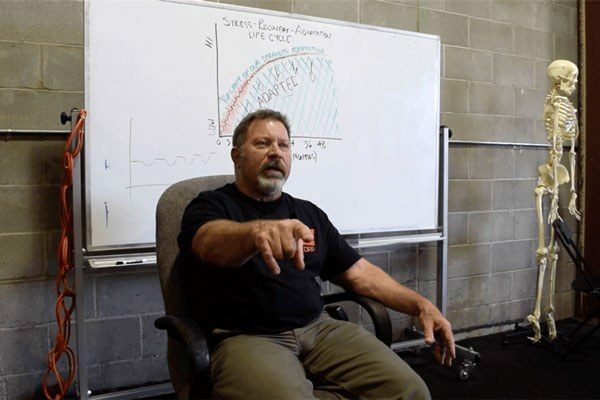 Through observation and discussion with other coaches, I’ve observed that the correct angle of the arm during the squat closely approximates the back angle, and – this is important too – it does not change during the movement. Yes, Virginia, the angle of the humerus relative to the floor should be about the same as the back angle in the low-bar squat, the elbows should not move up or down during the squat, and the aforementioned criteria on grip width, hand position, and wrist neutrality should also be observed. 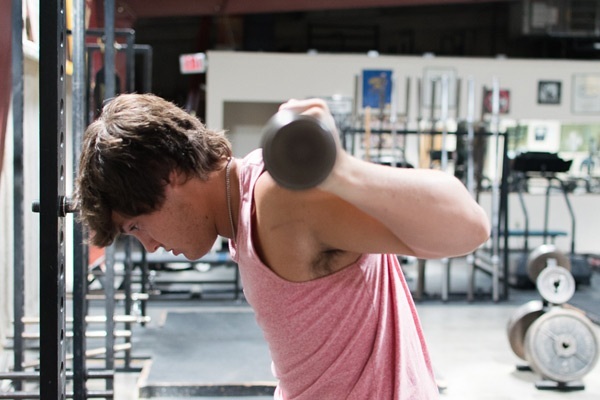 The Elbow Problem has the potential to get very complicated and resistant to coaching, particular in advanced lifters (not that I’m talking about myself here or anything…), which is why it’s imperative to fix early on! 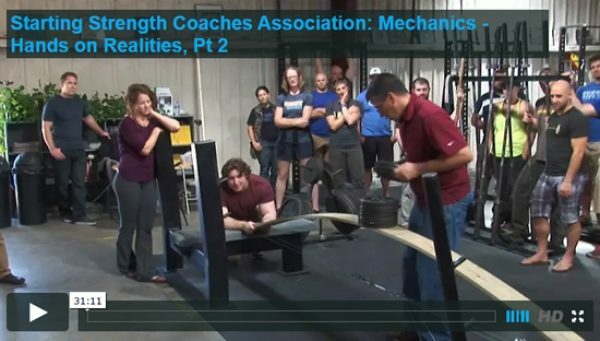 In a pinch, wrapping the thumb around the bar can be used if other coaching is not effective. 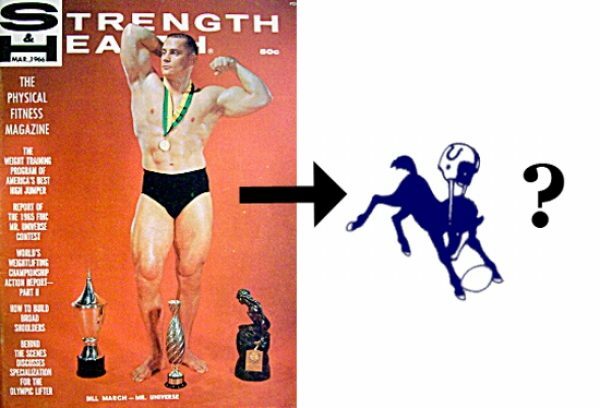 Alternatively, there’s likely a load that the lifter can squat while maintaining the correct positioning of the upper limb for a work set and as a coach, deloading the lifter to this weight would be a reasonable option, similar to a lifter squatting high, or not keeping his knees out when cueing couldn’t fix the issue. Again, my practice is to fix this early and stay vigilant about the positioning of the elbows in the squat.